Editor: In 1998 at the request of the MIA Members (Leaders) a Communications Consultative Group (CCG) was established with members who had expertise in communication nominated from the various regions. Lynn Dugas - Burke and Jan Hayes rsm (Americas), Margaret Twomey rsm (The Congregation) and Adele Howard rsm (Australia), Co-ordinator, formed the first group with guidance from Doris Gottemoeller rsm (President of the Sisters of Mercy of the Americas, Chair Member MIA). The decision to develop a plan to facilitate communication recognised the Members' relationships with each other: 'MIA is based on mutual trust which is built up by effective communication'. MIA believed that 'international Mercy Vision and international Mercy relationships are fostered when good information is available' and were in agreement that an effective communication strategy was necessary if the established Mercy International Justice Network (MIJN) and the newly emerging Mercy Global Concern (MGC) at the United Nations were to be able to engage successfully globally. In May 2001 the MIA Members asked Adele to continue as Co-ordinator of the Communications Consultative Group and in December MIACOM - Mercy International Communications - was adopted as the name for the Communications Group. MIACOM's purpose was articulated thus: 'to facilitate and make recommendations about the global picture of communications for the Mercy International Association, promoting integration, innovation, simplicity and effectiveness of global communication'. 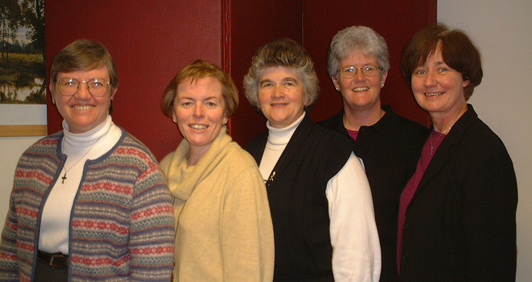 The Members of MIACOM - Sisters Adele Howard, Helen Marie Burns, Jan Hayes, Mary Conway and Denise Fox - met in Dublin that December and commenced initial planning for an interactive CD-Rom on Mercy and Justice, a project that would take three years to come to fruition. They had successfully initiated a weekly electronic newsletter Mercy E-news in August. Mercy and Justice Shall Meet (MAJSM) was developed to gather the wisdom and learnings of Mercy Sisters worldwide on specific issues of justice. Each Mercy Institute, Federation and Congregation was aware of the vast wisdom and experience that many of their Sisters had collected over their years in ministry and the dilemma of how best to pass on the valuable learnings of this experience. A multimedia resource was seen to be an effective tool to engage grassroots involvement and to collect the wisdom of grassroots action worldwide. A Sounding Board chaired by Katrina Fabish rsm (ANZ) was established in 2002. Fraynework was appointed the production company and Elizabeth Manning rsm (The Congregation) at the invitation of her congregation, generously joined the team in Australia to help develop the resource. A highly successful global search for contributions of material was conducted with contributions coming from Mercy Sisters and ministries worldwide. These images, texts, audio and video resources supplemented the filming that was undertaken in Peru, South Africa, Kenya, Australia, Ireland, England, America and Newfoundland, and helped ensure that the resource was as representational as possible of Mercy in the five geographic regions (Asia Pacific, Africa, North America, Latin & Central America and Europe) . Updates on the project were posted on the mercyworld.org website so that the Mercy network could follow the development of the CD-ROM throughout the course of 2003. This both helped promote the Interactive as well as engaged people in the process of its development. Mercy and Justice Shall Meet was demonstrated to the leaders in Dublin in May 2004, launched in Australia in September and in Ireland in November. It brought to fruition the inspiration of the Mercy International Justice Network Conference of 2001, the MIA Leaders Conference of 2002 and the Mercy Global Concern support for the UN Millennium Development Goals and the ongoing vision and inspiration of Catherine McAuley. Brought together by the MIACOM group and funded by Mercy Institutes, Federations, Congregations and Funds throughout the world, it was a truly global project of the Mercy International Association. Mercy and Justice Shall Meet used a narrative approach with the telling of 8 key stories. Three themes underpinned these stories: Violence against Women and Children; Racism in all its Forms; Displacement of Peoples. A theological reflection process underpinned and accompanied the stories which are opened up in the interactive for critique, analysis, reflection and action. The breadth and depth of the material presented on the CD ROM inspired a new appreciation for Mercy and justice worldwide, both within and without the Mercy network. Dozens of demonstrations were given in 2005 - 06 at conferences and workshops and in educational contexts, in particular in Great Britain, Ireland, New Zealand, Australia, Kenya, South Africa, the United States and at the UN. The resource won or was a finalist in a number of prestigious international awards such as the Horizon Interactive Award (US - Winner, Best Education and Training resource), the New York Festivals Interactive Media Awards (New York – Silver World Medal), the One World Media Trust (London – Finalist, New Media) and the ATOM Award (Winner – Best Multimedia Learning Reference, Australia and New Zealand). This was objective feedback on the quality of the production values. MIACOM met by conference call regularly and face to face annually, meeting in Melbourne in 2002 with a focus on MAJSM, in Burlingame in 2003 with particular interest in the structure and design of the new mercyworld.org website and in Dublin in 2004. During their May meeting in 2004 the members of MIACOM looked at the communication implications of Catherine’s Canonisation Cause and at ways to assist MIA and the Vice-postulator, Anne Hannon rsm, in this work. As a result, MIACOM was asked to create the ‘official’ image, of Catherine McAuley for the Cause for Canonisation. In 2006 a reflection DVD on the works of the Sisters of Mercy throughout the world, based on the song Circle of Mercy by Jeannette Goglia rsm (Americas), was produced as a resource to support MAJSM. This DVD used footage from throughout the mercyworld, including from the Eucharist at Westland Row, Dublin, held to celebrate the 175th anniversary of the founding of the Mercy Congregation.